Coming soon...I have a total fascination with these umbrellas. I have had to hold myself back thinking it was just my love of every thing bamboo that had captured my heart or was it just the thought of being able to look up at the rain as it fell on my head? Either way my passion won. 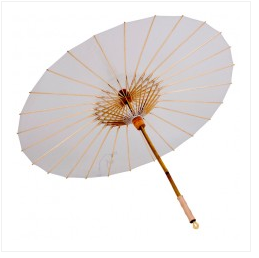 I will soon be the owner of one of these very "cool" timeless umbrellas! Watch out Deb mine might give your parasol a run for coolness. A few fun facts: It is designed to withstand wind gusts up to 40 MPH, yet light as a feather. The BRELLI is manufactured using sustainable and renewable bamboo, organic cotton, biodegradable plastic. It is also provides 99% UVA/UVB/UVC protection. It comes in cotton carrying case.